During pregnancy, it is common to think about labour and giving birth. Deciding on a birthing plan is very important and there’s no early time to think about it. In fact, the earlier, the better. This gives you the chance to look into all your options and do your research into the different types of medications to make labour easier. One option for giving birth is a caesarean section—more commonly referred to as a c-section. Most c-sections in the UK are now performed due to an emergency instead of being elective, especially for first time mothers. Those who have had them in the past—whether elective or emergency—will often find that they have the option the next time. Multiple babies are also commonly born through this method, especially three or more. A c-section is when the baby is removed through surgery. The doctors will perform an incision along the bikini line so the scarring is easily hidden afterwards. The uterus is cut and the baby is removed by hand. The doctors will then remove the placenta and sew the mother back up. Most of the time, the mother remains awake for the entire time of the surgery; a local anaesthetic is used called an epidural so the waist down is numbed. It takes a few hours for the anaesthetic to wear off but feeling does return. As long as there are no complications, the baby is out within 30 minutes and the mother is out shortly after that. The c-section is usually performed due to a complication during the labour. It could be that the baby is stuck or because the mother has chosen to have an epidural earlier and can no longer feel the contractions enough to push. The reasons vary and some mothers even book themselves in for a c-section due to other health problems. This could be part of your birthing plan but you need to know more about it before you decide. There are pros and cons to having a c-section. One of the biggest benefits is that there is less pain felt during labour. It can make it quicker as there is no need to push the baby and the placenta out. This is a consideration for those who fear their pain thresholds are too low to handle the possible hours or days of labour. This is also excellent for those with current medical conditions. Labour and pushing the baby out puts a lot of strain on the heart and those with heart conditions are usually offered c-sections. This is also common for those who have had issues with birth in the past. If the baby is in distress, there is no need to quickly find an operating room to get the baby out, which could be too late in the end. Medical problems during the birth for the mother can also be fixed quickly to avoid the mother dying during child birth. Those who have had c-sections in the past are often offered a c-section; usually up to three times. Mothers will know what to expect by then and it makes the labour process much quicker and smoother for all. By booking in for a c-section, you will know when you baby is born—at least, closer than if you left it for nature to take its course. Labour is usually induced to start the process and while it can take a few days, you know that the baby will at least be here on time! With more birthing options today than ever before, it's common for women to be confused and daunted. There is no need to worry. 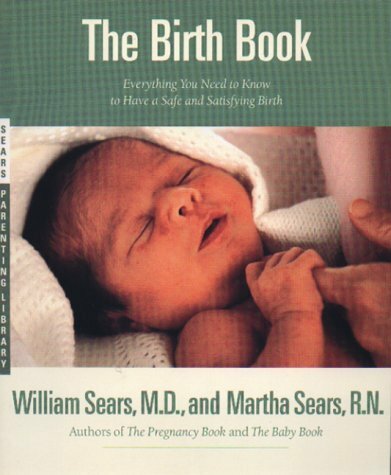 The Birth Book includes all the information you need to make a well-informed choice for a safe delivery of your baby. The main issue is that this is surgery. There are risks involved, including infections. It is not just the skin that is cut; the uterus is also cut. While the operating room is sterilised, problems can still occur and your body will still be under threat when moving back to the post-natal ward. Surgery also has a longer recovery time. It can take half a day to get back on your feet and then six weeks to fully recover. Having a baby naturally usually takes a few days to a couple of weeks to get over. You will not be able to do any heavy lifting after your operation in case your tear the stitches. This includes lifting the car seat! You will need to accept the help of your family and friends around you; something that not many people like to do or have the friends and family members available! Not everyone will be able to handle the local anaesthetic. There is a general option available where the mother is put to sleep but this can be quite daunting; waking up and not knowing if your baby is okay or not. There are also mothers who go into shock during the birth, especially when it takes longer than expected, and find the whole situation disorientating and scary. The skin and tissues weakens after having a c-section; like it would with any type of surgery. Most doctors will recommend only have three caesarean sections. There have been horror stories of women being told they must be sterilised after having the third—this isn’t the choice but it may be recommended to you. There is only so much that the body can take and more than three cuts will really weaken the tissue. Have you decided how you want to give birth? Should You Have a C-Section? Caesarean sections are excellent if there are complications or have been in the past. Booking one and making it clear you want one on your birthing plan can help you get everything organised and make sure your baby is safe. You will be monitored during your labour and the room will be ready when it is time to have the c-section. It is worth noting that if you have an elective c-section, yours may be pushed back; unless there is a complication. There may be other mothers who need emergency c-sections and they are usually put in front of elective ones due to the time-sensitivity. If you want your birth to be as quick and hassle-free as possible, it may be worth opting for a natural delivery. Just because you have had a c-section in the past, doesn’t mean you have to have one in the future. It is possible to have a natural delivery. You will usually need to speak to a midwife or doctor about this as there are concerns about it; you may tear the original scarring. Whichever you choose, make sure you are fully informed. Create your birthing plan with the information but remember to keep is flexible. You may have decided now that a c-section isn’t for you but there are times it is a necessity for the life of you and your baby. There is nothing wrong with having a caesarean and it doesn’t make you any less of a mother but there are risks that you need to be informed about.